Baby boy at 8 months. Do newborns communicate? Certainly, they do. They do not, however, communicate with the use of language. Instead, they communicate their thoughts and needs with body posture (being relaxed or still), gestures, cries, and facial expressions. A person who spends adequate time with an infant can learn which cries indicate pain and which ones indicate hunger, discomfort, or frustration. Intentional Vocalizations: Cooing and taking turns: Infants begin to vocalize and repeat vocalizations within the first couple of months of life. That gurgling, musical vocalization called cooing can serve as a source of entertainment to an infant who has been laid down for a nap or seated in a carrier on a car ride. Cooing serves as practice for vocalization as well as the infant hears the sound of his or her own voice and tries to repeat sounds that are entertaining. Infants also begin to learn the pace and pause of conversation as they alternate their vocalization with that of someone else and then take their turn again when the other person’s vocalization has stopped. 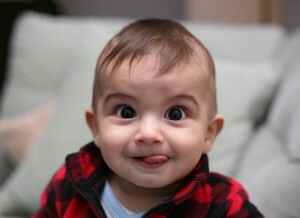 Cooing initially involves making vowel sounds like “oooo”. Later, consonants are added to vocalizations such as “nananananana”. Babbling and gesturing: At about four to six months of age, infants begin making even more elaborate vocalizations that include the sounds required for any language. Guttural sounds, clicks, consonants, and vowel sounds stand ready to equip the child with the ability to repeat whatever sounds are characteristic of the language heard. Eventually, these sounds will no longer be used as the infant grow more accustomed to a particular language. Deaf babies also use gestures to communicate wants, reactions, and feelings. Because gesturing seems to be easier than vocalization for some toddlers, sign language is sometimes taught to enhance one’s ability to communicate by making use of the ease of gesturing. The rhythm and pattern of language is used when deaf babies sign just as it is when hearing babies babble. Understanding: At around ten months of age, the infant can understand more than he or she can say. You may have experienced this phenomenon as well if you have ever tried to learn a second language. You may have been able to follow a conversation more easily than to contribute to it. Underextension: A child who learns that a word stands for an object may initially think that the word can be used for only that particular object. Only the family’s Irish Setter is a “doggie”. This is referred to as underextension. More often, however, a child may think that a label applies to all objects that are similar to the original object. In overextension all animals become “doggies”, for example. First words and cultural influences: First words if the child is using English tend to be nouns. The child labels objects such as cup or ball. In a verb-friendly language such as Chinese, however, children may learn more verbs. This may also be due to the different emphasis given to objects based on culture. Chinese children may be taught to notice action and relationship between objects while children from the United States may be taught to name an object and its qualities (color, texture, size, etc.). These differences can be seen when comparing interpretations of art by older students from China and the United States. Vocabulary growth spurt: One year olds typically have a vocabulary of about 50 words. But by the time they become toddlers, they have a vocabulary of about 200 words and begin putting those words together in telegraphic speech (I think of it now as ‘text message’ speech because texting is more common and is similar in that text messages typically only include the minimal amout of words to convey the message). Two word sentences and telegraphic (text message?) speech: Words are soon combined and 18 month old toddlers can express themselves further by using expressions such as “baby bye-bye” or “doggie pretty”. Words needed to convey messages are used, but the articles and other parts of speech necessary for grammatical correctness are not yet used. These expressions sound like a telegraph (or perhaps a better analogy today would be that they read like a text message) where unnecessary words are not used. “Give baby ball” is used rather than “Give the baby the ball.” Or a text message of “Send money now!” rather than “Dear Mother. I really need some money to take care of my expenses“ You get the idea. Child-directed speech: Why is a horse a “horsie”? Have you ever wondered why adults tend to use “baby talk” or that sing-song type of intonation and exaggeration used when talking to children? This represents a universal tendency and is known as child-directed speech or motherese or parentese. It involves exaggerating the vowel and consonant sounds, using a high-pitched voice, and delivering the phrase with great facial expression. Why is this done? It may be in order to clearly articulate the sounds of a word so that the child can hear the sounds involved. Or it may be because when this type of speech is used, the infant pays more attention to the speaker and this sets up a pattern of interaction in which the speaker and listener are in tuned with one another. When I demonstrate this in class, the students certainly pay attention and look my way. Amazing! It also works in the college classroom! The first two theories of language development represent two extremes in the level of interaction required for language to occur (Berk, 2007). Chomsky and the language acquisition device: The view known as nativism advocated by Noam Chomsky suggests that infants are equipped with a neurological construct referred to as the language acquisition device or LAD that makes infants ready for language. Language develops as long as the infant is exposed to it. No teaching, training, or reinforcement is required for language to develop. Skinner and reinforcement: Learning theorist, B. F. Skinner, suggests that language develops through the use of reinforcement. Sounds, words, gestures and phrases are encouraged through by following the behavior with words of praise or treats or any thing that increases the likelihood that the behavior will be repeated. Social pragmatics: Another view emphasizes the child’s active engagement in learning language out of a need to communicate. The child seeks information, memorizes terms, imitates the speech heard from others and learns to conceptualize using words as language is acquired. Many would argue that all three of these dynamics foster the acquisition of language (Berger, 2004).